These bacon BBQ chicken bombs have been on my to-do list for a while now. I was definitely looking forward to making them on my Char-Broil Big Easy, which is about as fuss-free as you can get. Good doesn’t even come close to describing them. Each bite pops with tender, moist chicken, cheese-stuffed jalapenos, bacon and BBQ sauce. Don’t fear the jalapenos if you’re not into spicy foods. They mellow out a lot while cooking. If you’re still not sure about using them, you can substitute poblanos. Just halve them lengthwise, remove the seeds, then halve them again depending on how big the peppers are. You’ll still get that great pepper flavor but without any heat. These bacon BBQ chicken bombs may seem to be complicated to make on the Char-Broil Big Easy, but they are not. You’re just pounding out some chicken breast, wrapping it around cheese-stuffed jalapenos, rolling it up and wrapping it in bacon. Then onto the Big Easy until done, basted with BBQ sauce, and devoured. That’s it. They’re highly addicting. I recommend making extra because they’re just as good leftover. Also try my Sriracha bacon onion rings, also cooked up perfectly on the Big Easy. Note: You'll need at least one Bunk Bed basket for your Big Easy, or even two, or you might have to cook these bombs in batches. Note: You want each piece of chicken to be approximately the width of the length of the jalapenos. In a bowl, combine the cream cheese and cheddar. Spoon the cheese mixture into each jalapeno half. Working in batches, place the jalapenos onto the chicken and roll up. Place seam-side down when done so they don't unroll. If you're chicken pieces are too big you might have to trim them a bit. Wrap 2 pieces of bacon around each rolled chicken. Tuck ends under the bacon to seal. The first few might not be pretty, but once you get a hang of it they're fun to make. And they'll taste great no matter what when they are done! Add the chicken bombs to the Big Easy basket (and bunk bed basket(s) if using). Do not let them touch. If you have to, cook them in batches. Lower the basket into the Big Easy and cook for 20-30 minutes, basting with the BBQ sauce every 10 minutes. Note: I use a very long basting brush to get down inside the basket and get the sauce on all of the chicken bombs. Be careful to not burn yourself. If you can't reach them, just baste them after they are cooked. Remove and check for doneness (165 F) on all cooking levels. Let rest for 5 minutes then serve. 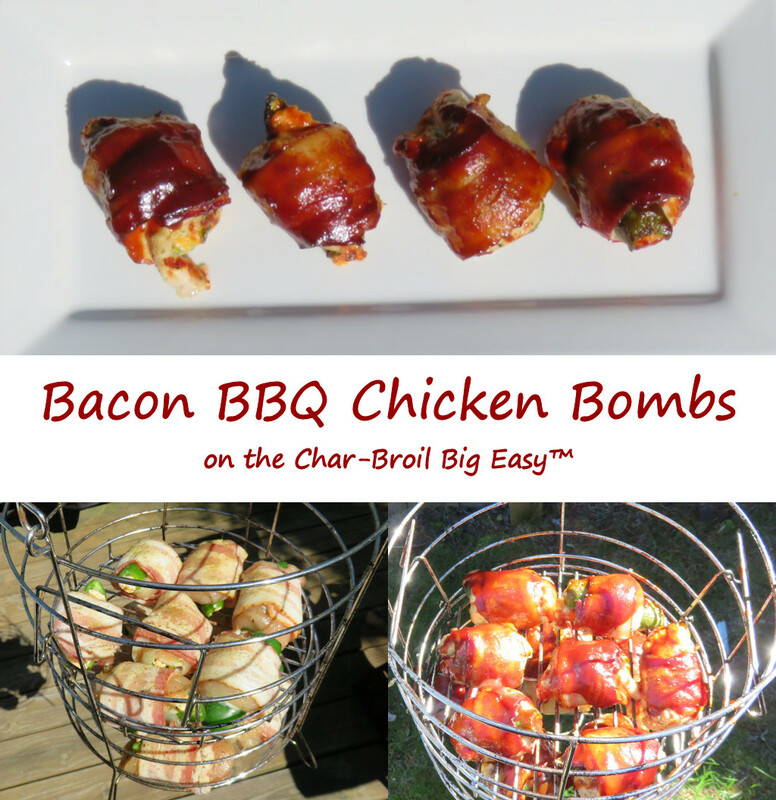 This entry was posted in From the Char-Broil The Big Easy™ and tagged bacon, Bacon BBQ Chicken Bombs on the Char-Broil Big Easy, bacon chicken bombs Big Easy, barbecue, bbq, big easy, Big Easy Appetizer, char-broil, chicken bombs, recipe by Mike. Bookmark the permalink.